Well, the de-barker is nearly complete all that remains to be done is to make the walkways for the workers to do their job. 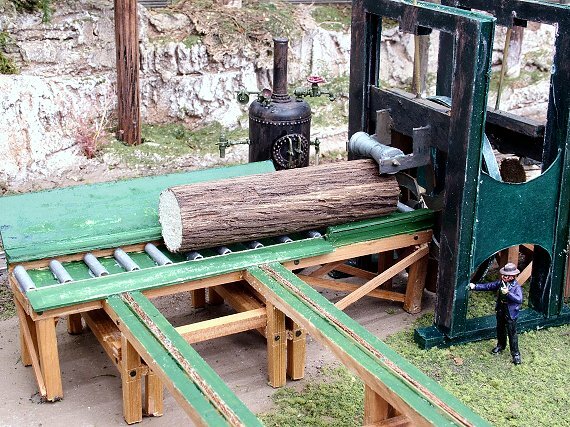 The first photo shows an overall view of the unit and how logs are brought up from the log pond (When I get that done). 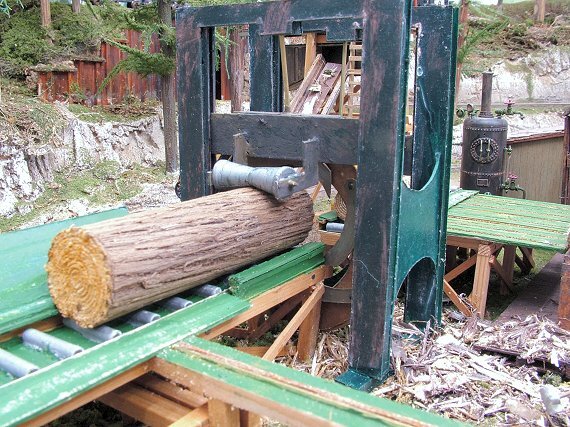 Photo #2 is the log lift out of the pond. 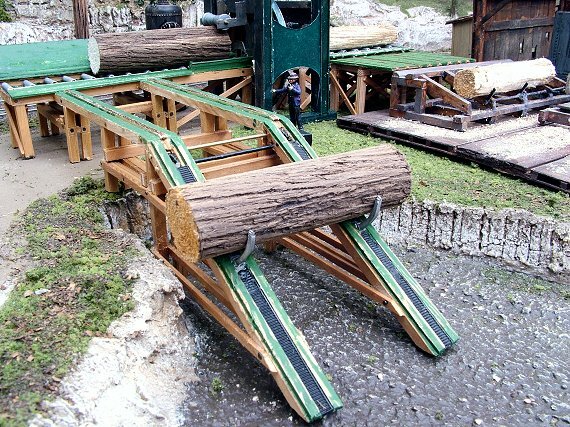 This works via a worm and pinion drive on the other side and hauls the logs to the top of the ramp. 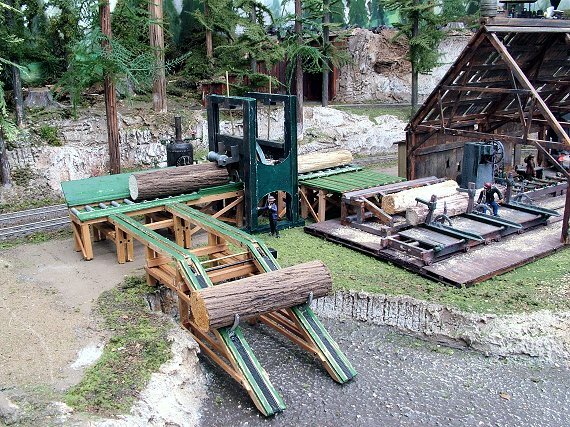 The next stage is for the log to be taken to the live rolls at the far end. A transfer table does this job. 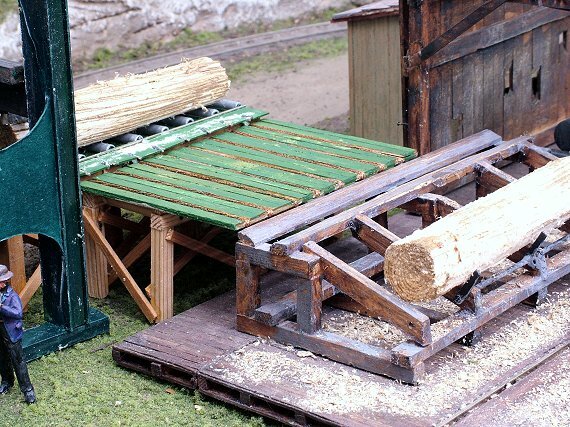 Once it arrives at the live rolls, it is taken upto the de-barker and held in place by heavy rollers. 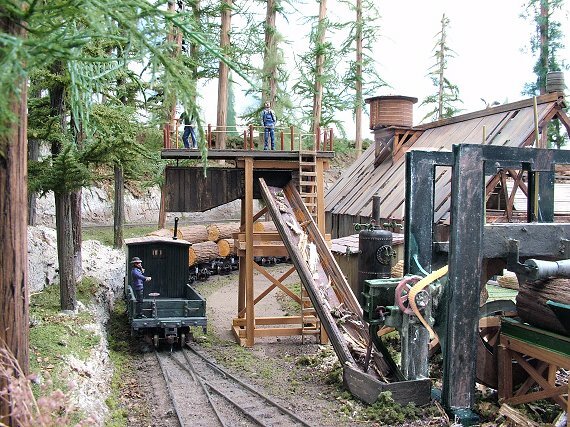 Once through the de-barker, it is fed onto the other transfer table ready to be lowered onto the log carriage. 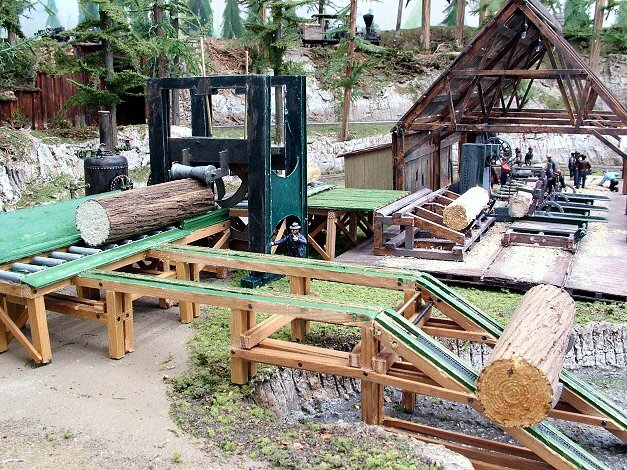 The final stage of this trip is to visit the sawmill. Excellent! that mill gets more and more interesting. Very nice to say the least. Nicely detailed. 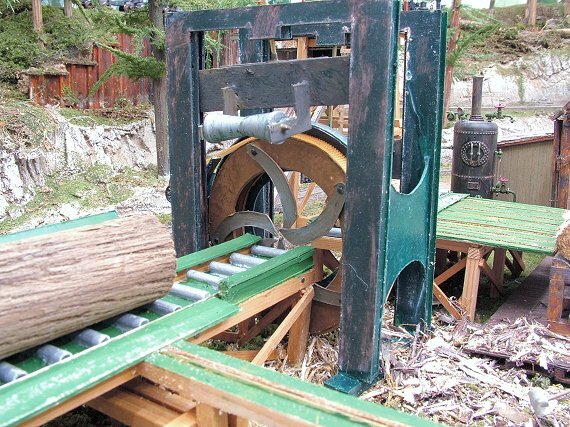 This sawmill definitely catches your eye. Well done Shamus, nicely detailed, definately a stand out piece of modelling. This attachment is a duplicate of one of the photos, it's used for the 'featured threads' promo. There's no need to view it as you've already seen it full size in the message above. These photo's are one way to get me back into the groove again. Well guys I now have the conveyer belt ER(not working LOL) taking the bark up and over the tracks into a waiting Gon/caboose. It just keeps getting better and better every day, hmm! 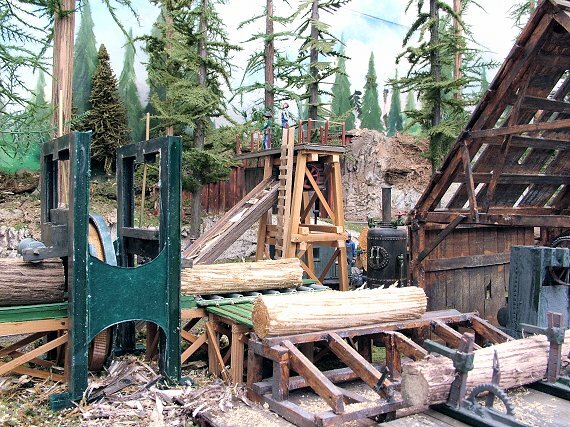 are you sure a modern mill like this fits in the backwoods setting? Final photo's of the barker. that is one of the nices sceens i have seen. Where do you find the time. My Mother used to tell me that when you got older everything was supposed to get easier, I would really like to ask her the definition of older. Cause, I have barely enough time at night to sit and have supper. While Shamu's modeling is quite good, that's not really what makes the scene work so well, it's all of the setting and details he adds. I've seen other models that were done as nicely but didn't quite convey the same sense of place. 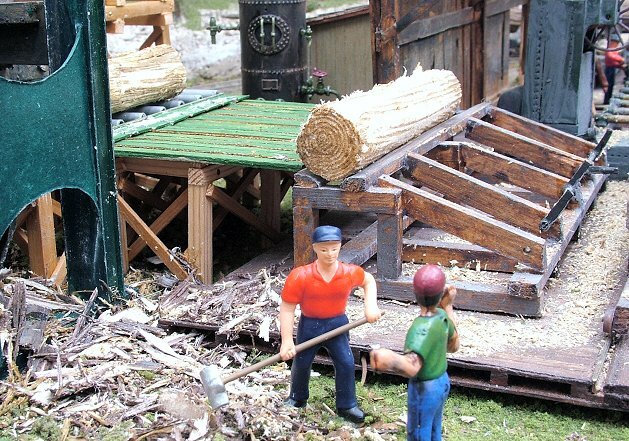 All of the little details, like the workers and the bark and logs and pond. They all work together, and to use a trite saying, the whole is greater than the sum of the parts. Fantastic modeling, really nicely done. Well I wouldn't really call it modern as its all made from wood and cardboard. Again A Fantastic scene Shamus that sure works for me!